Peavey is an American musical equipment company. They make a range of amplifiers, including tube, solid-state guitar and bass amps. Solid state amps such as those in Peavey's Vypyr series, use transistor technology. 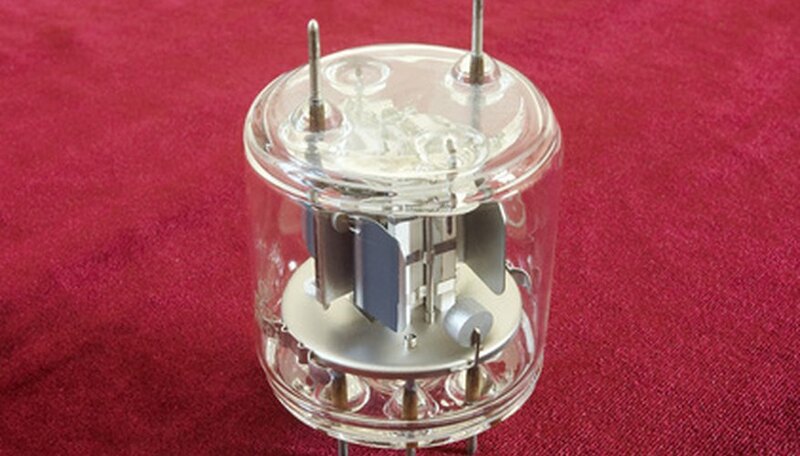 Transistor technology is more reliable and durable than tube technology. Peavey's 6506 series of amps are tube-powered amps. The vacuum tubes used to amplify the sound require require regular maintenance, while the solid-state transistors do not. Fix problems related to potentiometers, speakers and input jacks the same way, regardless of tube or solid-state amplification. Troubleshoot the amp. Finding the cause of the problem is often the hardest part. Turn the amp off. If it is a tube amp, leave it to cool for ten minutes. Dial the master volume to zero and the power up. If the amp fails to power up entirely, the problem is located in the power section of the amp. If it powers up and the lights come on but there is no sound, the problem is likely located in the preamp section. If there is sound, but it intermittently cuts out or is very poor quality, the problem could be either in the preamp or the speaker. Clean the potentiometers. Unscrew the back of the amplifier and remove the preamp. The preamp will slide towards you to a point. Disconnect the wires using a soldering iron to completely free the preamp. Using a cotton cloth and some plastic-safe contact cleaner, wipe away all dust and dirt from the the potentiometers. Often a little dirt is the cause of big problems. If the amp crackles when you adjust the volume or tone, this will probably fix the problem. Inspect the tubes and transistors. While the preamp is exposed, look at the transistors or tubes, depending on the type of amp you have. Transistors are much less likely to break down than tubes. Blown tubes will have a brown tint to the glass. If you spot any blown tubes, replace them with identical tubes. Typically, Peavey amps come with 6L6 type power tubes and 12AX7 preamp tubes, but check your manual to make sure you get the right replacement. Pull the damaged one from the socket and slot in the replacement. Make sure the amp is disconnected when you do this. Replace the transistors as a process of elimination. If replacement doesn't fix the sound problem, you can rule the transistors out as a cause. Reconnect any loose wiring. Use a flashlight to inspect the inside of the amp. Loose wiring can often cause intermittent sound dips. Melt away the existing connection and reconnect it with your soldering iron. Examine the speaker. Rattling sounds that occur when you play are caused by loose-fitting or damaged speakers. Most Peavey amps are fitted with Celestion speakers. Tighten the screws holding the speaker in place. If you spot a rip, replace the speaker. Radio Shack sells a contact cleaner that contains lubricant. This is a good choice for guitar amp maintenance. Always ensure the amplifier is disconnected from the mains when replacing tubes.